Today, a majority of consumers own a smartphone or tablet. What does this mean for retailers? It means it is time to jump on the bandwagon and mobilize your store to give consumers the 360-degree service they have come to expect. How Does Mobile Technology Affect Retailers? In a few words, mobile technology affects all aspects of the retailer’s operations. 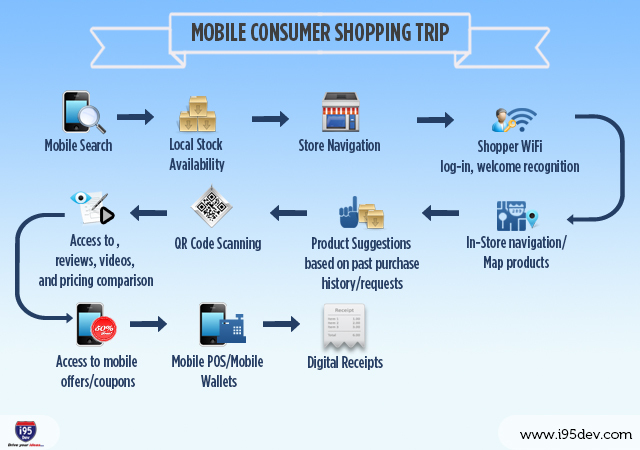 Consumers typically turn to their mobile device for information about a product before entering a store, while in the store, during the purchase and sometimes even after the purchase. This makes it apparent to retailers that it is vital to take advantage of mobile commerce and all its benefits. The process starts when consumers search for a product on your mobile site or a third-party site. They want to know more information about it, the level of stock at their local store, how to get to the store and how to find it inside the store. They want to be directed right to the product without too much hassle or having to interact with a sales associate. Once inside the store, consumers check-in with their mobile device through a variety of services using the store’s Wi-Fi network. They find their way over to the product to get a hands-on look at it, having a chance to feel it and thoroughly inspect it. At this time, they might consult their mobile device again to read various reviews or even check pricing at other stores to make sure they are getting the best price possible. They might watch video demos, scan QR codes to obtain more information or even consult their social media networks to see the overall opinion of the product in question. Consumers want the best of all available information, including specials or coupons, at their fingertips. The days of paper coupons are quickly leaving the horizon, paving the way for electronic coupons and personalized specials sent directly to their mobile device. While consumers are in the store, they might look for product suggestions, giving retailers ample opportunity to increase their per person sales based on each customer’s past search or purchase history. Some consumers will purchase items directly on their mobile phone, especially if they are offered an incentive for ordering online. Other consumers will purchase in the store, using a coupon or offer directly from their phone. The store personnel could use mobile POS and mobile wallet capabilities to make the sales process seamless for customers, encouraging them to purchase rather than making them wait in long lines, giving them time to change their mind. Today’s digital world has consumers keeping a digital copy of their receipts, rather than cluttering up cabinets and drawers, giving them the chance to lose receipts. This makes it possible to always have their purchase record on hand. In the event they want to exchange or return the product, they always have the appropriate documentation on hand.